I can't remember a single holiday when I was growing up that there weren't at least two lemon meringue pies on the dessert table. Every one tried to eat as fast as possible so that it wouldn't all be gone before we could get to it. 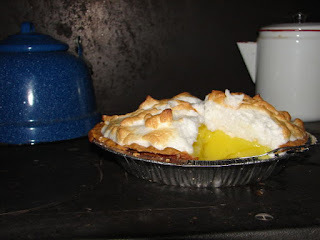 This lemon meringue pie recipe was in my mother-in-law's recipe collection. It is delicious! In a medium bowl, beat egg yolks stir in sweetened condensed milk. Add Real lemon and rind. In small bowl, beat egg whites with cream of tartar until foamy gradually add sugar beating until stiff but not dry. Spread meringue on top of pie sealing, and spread carefully to edge of crust. Bake 15 minutes or until meringue is golden brown. Chill before serving. Refrigerate leftovers. Do you like lemon meringue pies or a different pie?